Christians Posting Rainbows, Part 1: How Did We Get Here? Part 1: How Did We Get Here? Although the picture above presents an accurate conclusion, it does not represent the whole story. I believe that the real reason America is in the midst of this moral crisis has less to do with worldly leaders in the government and more to do with Christian leaders in the pulpit. Sure, I'm heart-sick over the number of near-sighted Christians who are expressing compromised convictions about homosexuality, but that grief does not compare to the disappointment I have in the Christian leaders who have brought us here. Is it just me or does anyone else see the direct connection between the doctrines of convenient Christianity and our present crisis of moral compromise? For years, some of the most outspoken leaders of evangelical Christianity have been unknowingly conditioning us for just such a time as this. Like a wolf in sheep's clothing, Satan has infiltrated the ranks and has used well-meaning Christians to undermine the spiritual discipline of the Christian community. If we are taught that everyone is born into sin (Total Depravity), why wouldn't we conclude that homosexuals are just born that way? Since it is by God's predestined design that they are who they are, why wouldn't we celebrate their advancements? If we are taught that predestination means we have no influence over our own eternal destiny (Unconditional Election), why wouldn't we conclude that life is meant to be enjoyed rather than a journey that requires free-will discipline and self-control? If we are taught that Jesus only died for some and the rest are predetermined to go to Hell (Limited Atonement), why wouldn't we de-emphasize personal responsibility within the message of evangelism? Why wouldn't we compromise and just try to coexist? If we are taught that we have no responsibility to accept God's gift because that would mean we are earning it (Irresistible Grace), why wouldn't we skip over the direct commands of God that require free-will acceptance of grace? Why wouldn't we assume that other commands of God (condemnation of homosexuality) are also open to selective obedience? If we are taught once saved, always saved (Perseverance of the Saints), why wouldn't we just settle in, compromise in order to coexist, and preach entitlements as the enticement doctrines of evangelism?When God becomes Santa Claus, His Fatherhood is diminished and our personal responsibility is discredited. For decades, the cancerous doctrines of convenient Christianity have been undermining our culture's resolve to be disciplined. Christianity sets the bar. Since Christian leaders have lowered that bar to the level of selective obedience, it's no wonder so many Christian folks are now posting rainbows and celebrating sin. Unfortunately, the present "Love Wins!" movement has been set up perfectly by those who emphasize a perverted view of grace. The doctrine of grace without human responsibility leads to a culture that believes they are entitled to acceptance without surrender to God. The Christian community simply MUST stop promoting politically correct spirituality and return to the age-old responsibility of all humans - keep your hands off the forbidden fruit. From the very opening moments of Creation, God has asked but one thing - choose Me over self. Until Christian leaders return to preaching the whole counsel of God, the average Christian will continue to assume that Christianity is a democracy and that the doctrines of men supersede the commands of God. Yes, the picture above represents an accurate conclusion but the sad reality is this, Christians bear a lot of responsibility as well. 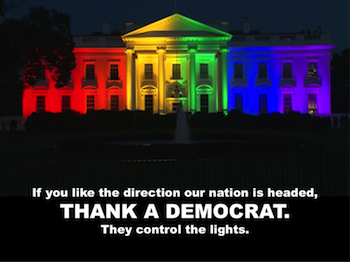 Those lights would not be on if it weren't for a large number of compromising Christians who helped place our humanistic President in a position to flip the switch. We did this to ourselves and judgment must begin at the house of the Lord. It's time to return to the Divine teachings of personal responsibility. Obedience is not the enemy of grace. Choosing God is the most precious gift we have to lay at the feet of the Savior. Don't diminish personal responsibility. For more information on this important topic, please read my article on convenient conversion. Back to Top of "Christians Posting Rainbows, Part 1: How Did We Get Here?"